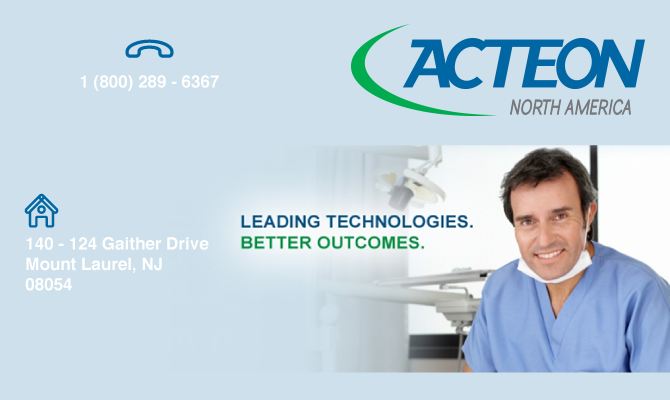 A subsidiary of The ACTEON Group®, ACTEON® North America is located in Mount Laurel, New Jersey (just outside Philadelphia), and provides all the sales, marketing, customer service and technical support for ACTEON® products in the United States and Canada. ACTEON® partners with all of the major dental chair delivery system manufacturers and dental distributors. ACTEON® North America also has a team of strategically placed field representatives as well as a state-of-the-art repair facility and fully stocked warehouse. With a steady stream of new and innovative products combined with effective and efficient customer support and technical service, ACTEON® North America continues to grow each year.